Post-colonial theory is a relatively new area in critical contemporary studies, having its foundations more Postcolonial Criticism brings together some of the most important critical writings in the field, and aims to present a clear overview of, and introduction to, one of the most exciting and rapidly developing areas of contemporary literary criticism. It charts the development of the field both historically and conceptually, from its beginnings in the early post-war period to the present day. The first phase of postcolonial criticism is recorded here in the pioneering work of thinkers like Aimé Césaire, Frantz Fanon, Edward Said, and Gayatri Spivak. More recently, a new generation of academics have provided fresh assessments of the interaction of class, race and gender in cultural production, and this generation is represented in the work of Aijaz Ahmad, bell hooks, Homi Bhabha, Abdul JanMohamed and David Lloyd. Topics covered include negritude, national culture, orientalism, subalternity, ambivalence, hybridity, white settler societies, gender and colonialism, culturalism, commonwealth literature, and minority discourse. The collection includes an extensive general introduction which clearly sets out the key stages, figures and debates in the field. The editors point to the variety, even conflict, within the field, but also stress connections and parallels between the various figures and debates which they identify as central to an understanding of it. 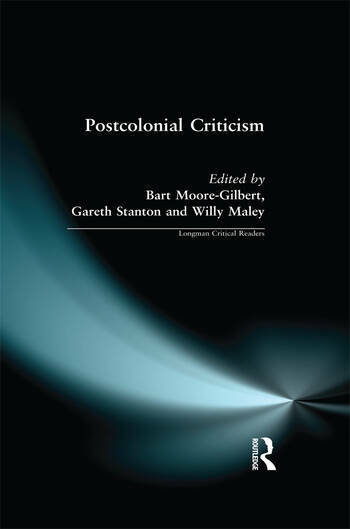 The introduction is followed by a series of ten essays which have been carefully chosen to reflect both the diversity and continuity of postcolonial criticism. Each essay is supported by a short introduction which places it in context with the rest of the author's work, and identifies how its salient arguments contribute to the field as a whole. This is a field which covers many disciplines including literary theory, cultural studies, philosophy, geography, economics, history and politics. It is designed to fit into the current modular arrangement of courses, and is therefore suitable for undergraduate and postgraduate courses which address postcolonial issues and the 'new' literatures in English. Bart Moore-Gilbert is a Lecturer in English at Goldsmiths College, University of London. Gareth Stanton is a Lecturer in the Department of Media and Communications at Goldsmiths College, University of London. Willy Maley is a Lecturer in English Literature at the University of Glasgow.